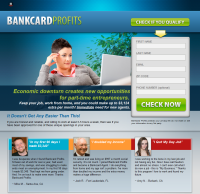 Bankcard Profit System Reviews - Legit or a Scam? In today’s consumer market, almost everyone prefers to make purchases using either a credit card or debit card. If a store, retailer, or website would like to give its customers the option of purchasing items with a credit or debit card, they must have a merchant account. Retailers buy these accounts either directly from banks or from third party companies that have partnered with Visa or MasterCard to provide merchant accounts. Often when a retailer buys this account, they are provided with the equipment necessary to allow their business to process the credit or debit card. Sometimes this is simple software where they enter the account number manually, but usually it is the credit card swipe machine that we’ve all become so familiar with. A Merchant Processing Agent, or Merchant Account Associate, earns money by selling merchant accounts to retailers that currently do not use a credit or debit card system. If they successfully sell an account, they are offered residual earnings on that particular merchant account. Whenever a card is processed by that business, they are charged a variety of fees by the credit card companies or the banks. You will receive a percentage of these fees for each transaction. A Merchant Processing Agent is a real job with real earnings potential. However, since it is a real job, you don’t have to pay a fee to become an agent. You simply apply to a company that has already been authorized by Visa and MasterCard for the job. Most companies hire these positions as 1099 Independent Contractors, which does mean that you will be in charge of your own work schedule and will be working from home. However, these authorized companies are not hiring people “regardless of knowledge or experience,” as Bankcard Profit System is. They require sales experience and successful completion of a mandatory (and free) training course. In addition, they openly admit that you will often be going to these businesses directly, not just sitting at your computer an hour a day as Bankcard Profits claims. The difference is that Bankcard Profits is selling a training course for $97, but after you’ve been trained, how or where will you work? You must be hired by an authorized third party company in order to sell merchant accounts – you can’t just hit the streets and attempt to sell your local diner an account. A major red flag with the Bankcard Profit System is that they are promoted by fake news sites. The fake news site is one of the most despicable ways that business scams try to lure customers. They, or their affiliates, create a page that is intended to look exactly like an online news site. They use this site to advertise their product, generally telling a story about a work at home mother who was able to use this program to make a living from home. These sites use IP trackers so that they appear to be from your state or home town. The FTC has already announced a permanent ban on fake news sites for companies selling health related products, as they intentionally mislead consumers into thinking that advertising slogans are factual claims. Many people in the industry think it will be a very short before they ban the fake news site across the board. There are far too many red flags to risk doing business with Bankcard Profits. If you have a sales background or experience working in the banking industry and are interested in actually being employed by an authorized merchant account company, just be aware that you should never have to pay for that opportunity. A real company will require you to fill out an application and have job training, just like any other traditional job opportunity. Average Rating for " Bankcard Profit System " is 0 out of 5 based on reviews.